As this is Germany it is a peculiarly organised form of chaos. On New Year’s Eve the locals (and the rest of us, but mainly the locals) launch the city’s debt-worth of fireworks into the sky, filling the night air with an almighty racket and a thick cloud of gunpowder-tinged smoke. The next morning the pavements and any open spaces are filled with the debris of last night’s celebrations, but some householders are already out on the street, sweeping it away from the pavement into piles for the binmen to collect. I head along the Berlin Wall trail, between the eastern district of Pankow and their western neighbours in Wedding. At 10.30 in the morning the city is quiet. The sky is overcast and there is a light drizzle falling, as if making sure that every last explosive from the night before has been extinguished. I like the fact that this trail – and its complete length of 160km is marked as a foot- and cycle path – that was once the dividing line between east and west in the city is now used by runners, cyclists, and dog-walkers, old couples and kids wobbling along on their bicycles, all using a strip of asphalt that was once part of one of the most fortified borders in the world. Just not so much this morning, as yesterday’s excesses and miserable weather keep most of city indoors. 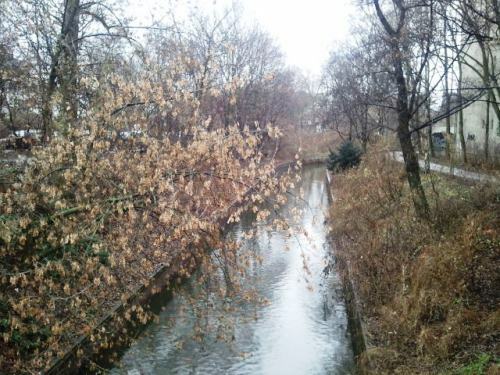 I turn off the wall route at the Bürgerpark Pankow, through which the Panke River sedately flows on its way toward the Spree. The park is livelier, with kids feeding the goats and families getting their first spot of fresh air of the year. Joggers circle the park, feet crunching along the gravel tracks, some of them seasoned and comfortable, others brand new but resolute, starting the year as they mean to go on. Out through the ceremonial arch and I am back on the pavement, strewn as before with shredded red paper, orange traces of whatever it is that makes the fireworks go bang, and the stray wooden poles of the rockets that a few hours before we exploding overhead. The rain is falling heavier now, the sky a melancholy, hungover grey. It is one of those winter days where it never really gets light, as if whoever is in charge of the weather has decided to take a day off. But despite the weather I like being out, the feeling of having the trail, the park and the streets almost to myself, whist the few people who are out and about are polite, wishing each other a happy new year in an overflow of goodwill that will only last until tomorrow and the return of real life. Some time out in the light rain and then back for breakfast with friends. It’s not a bad way to start 2012. This entry was posted in Diary on January 1, 2012 by Paul Scraton.